Taipei, Taiwan — Open web and mobile technologies are two hot topics among the open-source developer community in Taiwan this year. Opera Chief Standards Officer, Charles McCathieNevile, will deliver the keynote presentation, titled “HTML5- more Web for more people” at this year’s COSCUP / GNOME.Asia, the largest annual free and open source software conference, organized by the local communities. This year, the conference will be jointly held with the GNOME.Asia Summit on August 14-15, bringing the exciting development of open web and mobile technologies and the GNOME desktop environment, as well as how they leverage the world-leading hardware industry in Taiwan. More than 800 people are expected to attend the conference this year. In the keynote address, Charles McCathieNevile will discuss the development of HTML5 and other web standards. He will talk about how these web standards are developed and what new possibilities they offer to web developers, and application developers in general. He will also look at how the open web stack based around HTML can be used to improve users’ experience of applications by making them accessible to all kinds of people with all kinds of technologies. In addition, Opera Web Evangelist Zi Bin Cheah will also speak on the HTML5 & Web Technology track at the conference on the topic, “Tips and tricks of CSS3 for web Designers” on Saturday, August 14 at 11:30 a.m.
Oslo, Norway – Opera joins the exclusive one billion served per day club. According to Opera Software statistics, Opera Mini users viewed more than one billion pages on July 25, 2010. Every second, Opera Mini servers compressed more than 11,500 pages before sending that content to phones around the world. Opera Mini, the world’s most popular mobile phone browser, delivers the best Internet experience possible on more than 3,000 mobile phone models. The unique Opera Mini technology compresses data by up to 90 percent before sending content to the phone, resulting in faster page loading, improved speed, and lower browsing costs. Go to m.opera.com with your phone’s default browser and Opera will automatically select the optimized version for your phone. Oslo, Norway – Mobile web use is exploding in Africa, according to Opera’s State of the Mobile Web Report, published today. Triple-digit growth rates are routine in the region where page views in the top 12 countries in Africa increased by 182% year-over-year, unique users increased by 124%, and the amount of data transferred increased by 160%. Opera’s State of the Mobile Web Report, published monthly, provides information on the top global trends affecting the mobile Web. The full report is available from http://www.opera.com/smw/ (English only). This month’s report includes a geographic spotlight on Africa, and also highlights the top sports sites on the mobile Web. In June 2010, Opera Mini had over 59.4 million users, a 3.2% decrease from May 2010 but an increase of 124.7% since June 2009. The slight decrease in key metrics can be traced to certain countries where we have experienced some technical and political challenges that now are about to be solved. Opera Mini users viewed over 27.3 billion pages in June 2010. Since May, page views have gone down 3.4%. Since June 2009, page views have increased 161.8%. In June 2010, Opera Mini users generated over 416 million MB of data for operators worldwide. Since May, the data consumed went down by 4.0%. Data in Opera Mini is compressed up to 90%. If this data were uncompressed, Opera Mini users would have viewed over 3.8 PB of data in June. Since June 2009, data traffic is up 147.1%. Ukraine, South Africa, the United States and Vietnam all rose one position on the list of top ten countries (number of Opera Mini users), while Nigeria dropped from position 5 to position 9. In Part 3 of this month’s report, we look at countries in Africa. The top 12 countries using Opera Mini in that region are South Africa, Nigeria, Kenya, Egypt, Ghana, Sudan, Libya, Tanzania, Ivory Coast, Namibia, Mozambique and Mauritius. Some numbers: From June 2009 to June 2010, page views in the top 12 countries in Africa increased by 182%, unique users increased by 124%, and the amount of data transferred increased by 160%. Growth rates in Africa: Sudan and Ghana lead the top 12 countries of the region in terms of page-view growth (4,645.6% and 916.5%, respectively). Sudan and Ghana also lead the top 12 countries of the region in growth of unique users (1,225.0% and 498.8%, respectively). Kenya leads the top 12 countries of the region in page views per user, with each user browsing 639 pages on average each month. Facebook, Google and YouTube all do well in Africa. Facebook is the top-ranked site in six of the twelve listed countries, and Google is ranked #1 in the remaining six countries. Nokia remains the most popular handset brand in Africa, followed by Sony Ericsson, Samsung, and LG. Opera desktop features, like Speed Dial, Opera Link, password manager, make it easier for you to surf on the go, by reducing the time and effort it takes to get to a website. Tabbed browsing, a virtual keyboard, kinetic scrolling and auto-rotation to landscape make browsing with Opera Mobile easier and a lot more fun. When the network speed makes browsing tough, turn on Opera Turbo. Use our servers to compress webpages on the fly and more than double your browsing speed. With over 61 million users worldwide, Opera Mini is the world’s most popular browser for mobile phones, allowing much faster browsing speeds, while keeping the costs to a minimum. 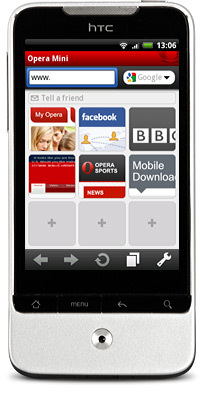 Browse at lightning speed today by downloading the free Opera Mini browser from the Android Market or at m.opera.com.